On the last leg of its recent U.S. tour, Ailey II visited the small, picturesque Southern town of Madison, Georgia, known for its historic neighborhoods boasting gorgeous plantation-style homes. The theater that the 12-member ensemble occupied was no exception to its celebrated surroundings, situated in the elegantly restored 1895 Romanesque Revival building known as the Madison-Morgan Cultural Center. Originally holding one of the first graded public schools in the Southeast, the Center has now been renovated to hold a small, intimate theater. 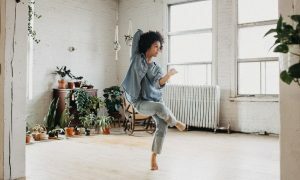 Ailey II arrived in town fresh from performances in South Carolina and Pennsylvania, as well as New York’s premier Joyce Theater only a week before. It made one wonder how this small theater compared to the grand and prestigious stage at The Joyce. Were the young dancers still coming down from the high of presenting their first independent season there? If they were, they certainly didn’t show it as they performed with zeal and stamina. Although, it’s no question that they struggled with the stage, as it was significantly too small for a company of this size presenting works of this magnitude. Ailey II’s Gentry Isaiah George, Tyler Brown, and Jamal White in Troy Powell’s ‘The External Knot.’ Photo by Eduardo Patino. The evening’s program featured three rich and diverse works. 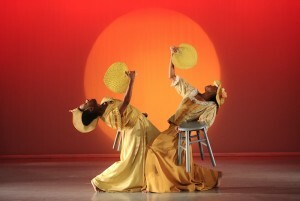 First up was the 2007 work The Eternal Knot, choreographed by the troupe’s Artistic Director Troy Powell. As a last minute change to the program, this work was even more of a delight and a surprise. 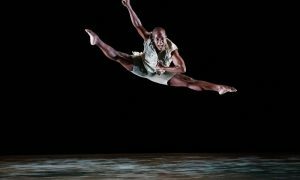 Dancer Chalvar Monteiro, who I first saw perform with Kyle Abraham at Jacob’s Pillow Dance Festival in 2011, shined in this work, showing off his significant dance training and wonderful stage presence. His diving arabesques were breathtaking and his natural fluidity and significant strength made him a powerful lead. The intricacies of this piece were stunning, with the repetitive movement of the dancers bending into a deep second plié with their hands flapping in front of them being an image that stuck out. Yet, by far, the highlight of The Eternal Knot was its conclusion. The music by Philip Glass and Robert Schumann reached a place of euphoric joy, with pulses of energy radiating off stage as the enraptured dancers joined together in blissful synchronicity, their blue-hued costumes by Jon Taylor tossing back and forth as they executed rapid-fire steps. The only fallback to this was the obvious tension for some of the dancers who felt claustrophobic and at a loss for space. This is a big work requiring property to travel. It made one wonder why this work was chosen to replace Dwight Rhoden’s Hissy Fits. Why not a work that could better adjust to the stage? Ailey II in Manuel Vignoulle’s ‘Breakthrough.’ Photo by Eduardo Patino. The second work, Manuel Vignoulle’s newer Breakthrough, achieved this much better, with the dancers seeming to come into their own even more. Set to music by composer Mikael Karlsson, it’s about “people trying to break through the heavy weight of conventional behavior and morals in a world where feelings and emotions are prohibited for the sake of an illusory peace,” as described on the company’s website. The colorful turtlenecks helped to bring this scenario to life, symbolizing conformity and cultural formality as the dancers moved through the six sections. Vignoulle’s blend of modern dance with hip-hop was a mesmerizing combination, with newcomer Deidre Rogan really achieving the movement with oomph and precision. She’s definitely one to watch. The two duets, first with Shay Bland and powerhouse Terrell Spence and then with the lovely Samantha Barriento and poster boy Jamal White, were the standout moments, even with the occasional disruptive fits of laughter from children in the theater who might have been to young to attend. Bland and Spence conquered the difficult transitions with confidence in their duet and brought great focus. Barriento and White came after a vigorous running section, and conveyed the anxiety of the piece with a somber maturity. Ailey II in Alvin Ailey’s ‘Revelations.’ Photo by Eduardo Patino. 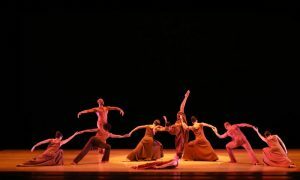 After a short intermission, Ailey II performed Alvin Ailey’s hallmark Revelations, which brought the expected applause and cheers at the end of each piece. Of course, the dancers glowed in each section, proving why they were chosen for this elite troupe out of hundreds of other hopefuls. While watching this work, I also took a minute to note what an exciting moment this was. In this historic theater that was built when this town was still in the throws of slavery and racism, here was a troupe of mostly black dancers being celebrated for their artistry. It was an instant I am thankful to have been a part of. As the dancers joyously concluded with the bright and traditional Rocka My Soul in the Bosom of Abraham, I imagined all the former slaves who were buried just down the street proudly smiling and rocking with them – and then I smiled and rocked too. What a wonderful moment in an evening of topnotch dance from this truly superior company. Photo (top): Ailey II in Manuel Vignoulle’s Breakthrough. Photo by Eduardo Patino.